"File Tiering and Stubs-Benefits and Savings from Tiering Your Files"
File Tiering and Stubs – What You Exactly Need to Know To Make the Right Choice. We’ve all heard the saying, “The devil is in the details.” Nowhere is this truer than it is when talking about the stubs used in tiering. Stubs require the cooperation of the storage hosts, the network, protocols, security, end-user applications, and client systems. What works for one may or may not work for another. How do you stub a file? When the stub is gone, how does an end-user find their tiered files? Do you care whether all of your data reaches Tier 2, or is it all right for the tiering system to throw some of it away? If compliance becomes an issue, can your tiering solution do what will be required? 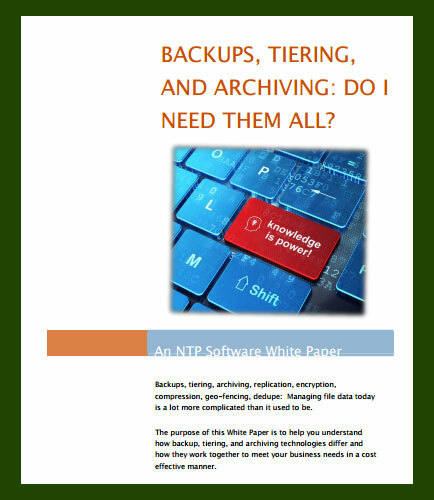 Read this whitepaper to learn how the right stubbing mechanism can provide end-users and applications with a seamless and unchanged experience as your organization moves to realize the benefits and savings from tiering your files. What is Data Visualization ?